Nagging popup to add extension won't go away, I already have extension installed. I can barely use this web site. Nag box to get 1PW extension pops up EVERY FEW SECONDS and only has "Get It Now" with no option to dismiss. I already have the browser extensions installed. Both browsers are now UNUSABLE. 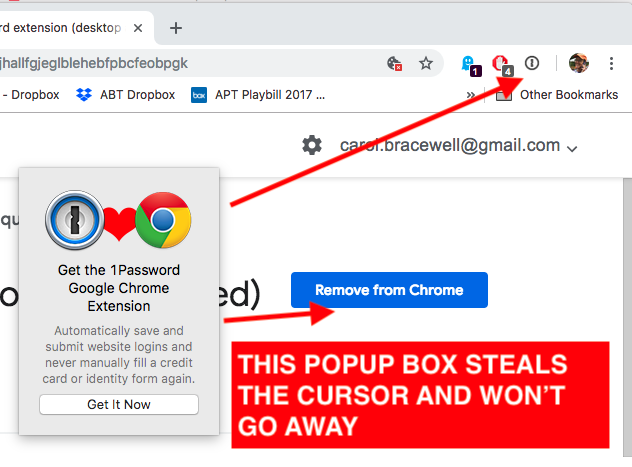 Popup takes the cursor as I type this, every few seconds. I can barely log in because i don't have time to type my password. Laptop running Sierra 10.12.6 works ok, older version of Chrome. Please help, I am so screwed. Referrer: forum-search:Nagging popup to add extension won't go away, I already have extension installed. FF and Chrome. I'm sorry to hear about the trouble. Would you be able to post a screenshot of what you're seeing? To alleviate the problem temporarily you may want to move 1Password 7 from the Applications folder to the Trash and then restart your Mac.